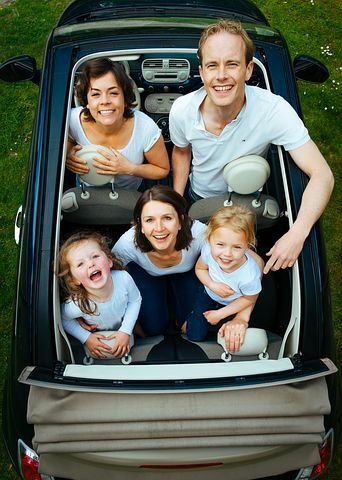 Your family has just loaded into the car on the way to a family camping trip. The kids, as well as you, are so excited; however, as the hours in the car pass, children and adults can become bored and irritable. Playing an assortment of road trip games can help turn a rather grueling trip into an enjoyable and pleasant car trip. When choosing a game, you should consider the ages of the children in your car. Small children may not be able to play the same type of games as older children. However, older children will become bored with simple games that they consider too childish. Luckily, there are a number of games that is perfect for all ages. Check out the following games that can help pass the time and create lasting memories on your next family road trip. One of the most popular games that can be played with children of all ages is I Spy. You begin by saying I spy with my little eye something that is (color) or another type of clue. Everyone in the car then guesses the answer until the appropriate item is guessed. The person that guesses correctly then get to be the spy while others guess. Young children will enjoy the Cookie Jar game. You start by saying “(name) stole the cookie from the cookie jar.” The person that you named then says “who me?” and you answer “yes, you.” The person then responds with “couldn’t be” and then everyone asks “then who stole the cookie from the cookie jar?” Another person is chosen and the game continues. Older children and adults can enjoy scouring the roadways for licenses plates for all fifty states in the United States. Slug bug or punch bug is another game that older children will enjoy. When a Volkswagen Beetle is spotted, the first person to say “punch bug (color) gets to slug someone else. Playing games while in the car is a great way to pass the time. In addition to these games, you can come up with a 20-question game or any other games to help keep the road trip fun and entertaining.